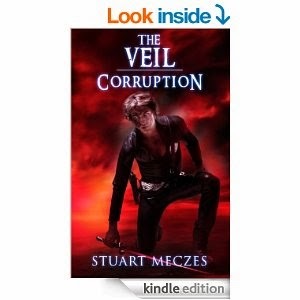 The Veil: Corruption (Hasea Chronicles Book2) by Stuart Meczes. It’s been six months since Alex and Gabriella stood against The Sorrow and won. The Veil still stands uncrossed, and with every passing day the possibility of finding the person stolen from Alex alive diminishes. But after an influx of new Awakenings, the Alliance is being stretched to breaking point. A melancholic Sophia is acting mysteriously and Sage Faru has set the formidable task of gathering a team of Guardians willing to enter Pandemonia. Meanwhile the looming threat of a new, stronger SOS hides in the shadows. But that is the least of Alex’s worries. Something is growing inside of him. Something dark and vengeful that whispers in the silence. Something that plagues his dreams with visions of a horrifying apocalypse. An apocalypse he will start. As Gabriella struggles to hold everything together and Alex struggles not to fall apart, one thing becomes clear. Before they can cross the Veil and stand against Hades, Alex must first defeat his greatest enemy. Himself. This is the sequel to the first book in the Hasea Chronicles, 'The Awakening', which I reviewed a while ago. The first book was fantastic and was one of my favourite urban fantasy books of last year, so I definitely had high expectations going into the sequel. The first book left it in a bit of a cliff hanger where the main character, Alex and his friends were about to set off to the Veil, where his father is believed to still be alive. Honestly, I was a bit disappointed in the storyline. I was looking forward to reading about the Veil and discovering what adventures lay beyond, and so I felt a little let down that they they didn't get there. Instead the whole book was spent preparing to go to the Veil. However the story wasn't all bad and the novel finished on a dramatic high, with all the great traits of the first book came flooding back. Characterisation was spot on, and I enjoyed the twist in Alex's character as he struggled with his inner demons. He continued to grow from the first book and Meczes did a good job in adding further layers of depth to Alex. The other characters also got a fair look in. The action scenes were brilliantly written, just like the first book, and the author has a way of creating vivid, tense scenes that are easy to picture. Not as great as the first book, which admittedly set the bar rather high, thus making this review appear more critical that it perhaps warranted. The book still held much of the qualities of the first, just not enough. Now I'm looking forward to the third book in the series, which should be out soon.